Earle Herbert was born in Racine, Wisconsin on November 18, 1889 to Edwin A. and Florence G. (Clemmons) Tostevin. He was the middle of three sons which included older brother Walter and younger bother Edwin, Jr. In 1909, his father moved the family from Racine to Mandan and purchased the local newpaper, The Mandan Pioneer. Only 20, Earle was not yet experienced enough to assume a major role at the paper. At the time, the Pioneer was also only a weekly publication and was not large enough for two editors. 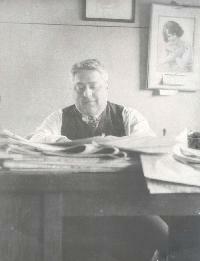 Earle went to work for the Grand Forks Herald , but rejoined the family business at the Pioneer in 1912. He had many friends and interests and enjoyed being an eligible bachelor. It was 1917 and Earle was inducted into the Army. At the same time, the Grand Forks Herald hired him a "war correspondent" to write a column for their paper. He also sent letters home which were published in the Mandan Pioneer. He was very good at writing pieces that were interesting and frequently gave news of North Dakotans serving overseas. His talent was getting his articles past the censors while retaining a real flavor of the war and foreign places. He usually started his columns with "Somewhere in France... "
After receiving a medical disability, Earle was able to convince his superiors that he was a much better newspaperman than a soldier. Even the US Army's censor recommended him. He was reassigned to the Stars and Stripes (the Army's official publication) as a columnist and censor until the end of the war. Earle returned to Mandan and assumed the editorship of the Pioneer. With his war correspondent credentials became very influential regionally in the news business. He served as chairman and other positions in professional news organizations for both the State and the region. In 1925, Earle married Agnes Olson who was his father�s personal assistant. Agnes had come straight out of secretarial school to work at the Pioneer. Tostevin Senior always referred to her as his �right hand�. Agnes was an intelligent, witty woman and together, she and Earle were active in the Mandan social scene. Earle was nationally known for his prize-winning gladioli and served a term as the president of the National Gladiolus Society. They built a home and landscaped it to focus on their beautiful gardens. Friends and family were stunned when Earle suddenly died at the age of 43 on August 20, 1933. A tremendous out-pouring of articles and editorials in regional and national newspapers mourning the loss of such a talented writer and editor. Earle was also known for his verse and he called himself �a Hoosier poet�. Agnes continued to work at the Pioneer in an administrative capacity until the business was sold in 1963. She lived at their home on 6th Avenue until her death in 1969.